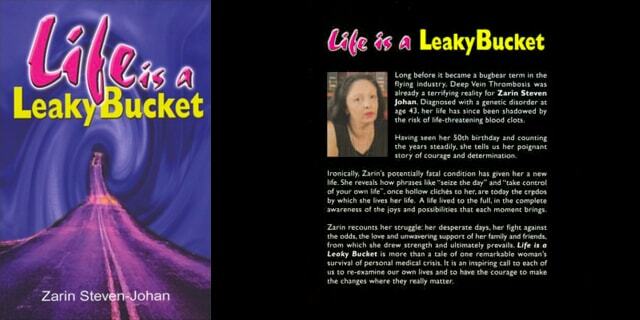 Zarin’s biography tells the story of how she has battled through a difficult life and illness and then emerged with the determination and courage to live a full life. She recalls how she was born into a blue-blood family in India and was accustomed to a lavish lifestyle. But the India-Pakistan war threw her family into poverty and she had to adapt. Later on in life she had to endure scornings from her mother and betrayal by her brother. At the age of 43 she was diagnosed with a genetic blood disorder. Her life is now shadowed by the risk of life-threatening blood clots. Zarin’s struggle is more than a tale of one remarkable woman’s survival of personal medical crisis. It is an inspiring call to each of us to re-examine our own lives and to have the courage to make the changes where they really matter. Zarin passed away in October 2007. She was a regular contributor to the Protein S Deficiency Forum. We are happy to provide links to commercial sites and have details of various items for sale in our products and services section. However we do not endorse any products, services or treatments. We earn commission on sales referrals from this page which helps to support our web site running costs. All trademarks and registered trademarks shown on our web site are acknowledged and are the property of their respective owners.